Featured Author series was FABULOUS!! Again THANK YOU AUTHORS you did a FANTASTIC JOB!!!! 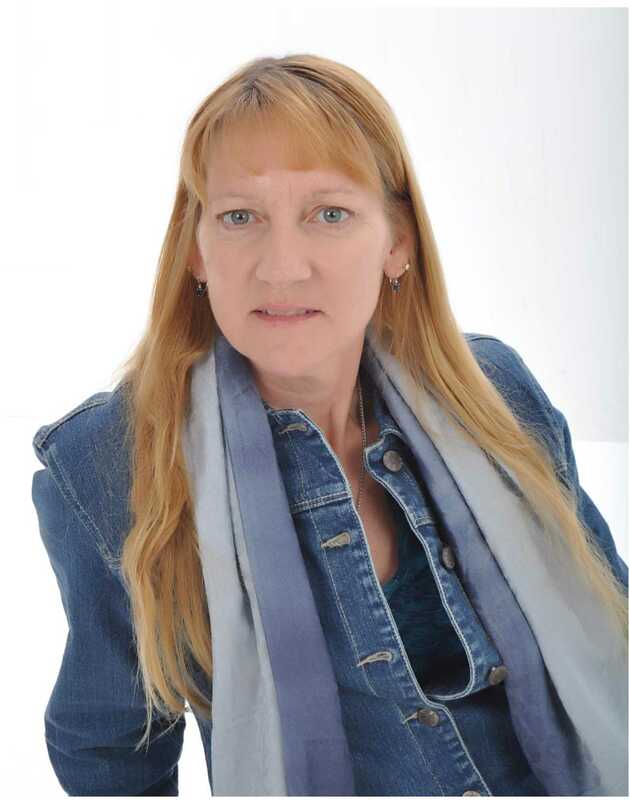 Hi, I’m Christine Murphy, romance author by night and careerist in clinical laboratory by day. I have long enjoyed delving into new worlds and characters through my imagination and have read hundreds of books through the years. Having had quite the imagination since childhood, I decided to put all that creativity down on paper and share it with the world. I have lots of experience to pull from as I have traveled throughout the United States and locations throughout the world. Looking out my back lanai, there is a small pond where the wild-life will gather and the flowers bloom in exotic pinks and purples. This is my place of peace and freedom that I have searched for and where my husband and crazy African Gray Parrot, Raider, hang out with me. It’s the place where my creativity runs wild as I spin tales of adventure and passion. I have been writing in my head since I was a teenager and I finally realized I needed to capture these unique characters, civilizations, conflict, passion, and love in writing. To capture the strong, spirited, and powerfully attracted characters and all of their adventures and share it with others who are searching for that very thing to make their lives more exciting. If I accomplish nothing else in life, I hope to share the romantically magical worlds and the lovers that I see with all of the passionate readers out there. 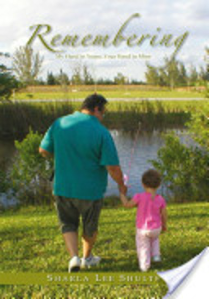 I can be found at my website, http://christinemurphybooks.com/ and my Twitter or Facebook. https://twitter.com/CLMurphyBooks, http://www.facebook.com/ChristineMurphyBooks Check out my blog at http://christinemurphybooks.com/blog. 2. What made you decide to write (the genre of your book), were there any influencing factors, or were any of the stories based on true events. I’ve been reading and writing in my head for years so after my husband had to go through chemotherapy for leukemia it taught me something. Life is too short and if you really want to live fully do something you really love – don’t put it off. I love to read romance and love to spin tales of romance in my head so why not write them down and share them with all of those who love to read romance. The specific area of romance I enjoy is paranormal because I love heroes and heroines who may be vampire, or have special powers, or even be part demon. As long as there’s love and passion, I’m hooked even if I create it in my own mind. I also like futuristic romance where a touch of science fiction may be sprinkled in. All of my stories are fiction but I do pull from things I may have seen or done in my travels. Some of my books have information on lab testing which is my day job where I may talk about DNA analysis or some other lab procedure. I weave fact and fantasy together to set up quite the romantic story. 3. How do you promote your book, and do you find that difficult or just par for the course. I promote my books through my publisher, but a lot of it I do on my own and includes my website, my blog, my twitter, my facebook, and a whole bunch of other odds and ends. I also go online and promote in groups or through different blog hops and eBook Fairs. The biggest challenge is to find the time as I have a day job, take care of my husband and my African gray who is even calling to me now for attention, and let’s not forget the ever important writing, my first love. 4. Do you remember your first review and how it made you feel? (If it was a bad one, also tell about your good one too). I remember my first good review which was five stars and gave me so much excitement I wanted to sit down and write a whole other book then and there. The person had enjoyed it to the point they had stayed up all night reading it and wanted to make sure I was going to write more. They just knew the following books would be just as exciting to keep one up at night to finish them. I’ve also had bad reviews with one star. I kept thinking the person reviewing had started out as if they were enjoying the book actually sounding like they were praising the book in the first paragraph and as they went on by the end they were slamming the books. I almost had the eerie feeling the person had gone from a good mood to a bad mood and thought maybe they had gotten in an argument with someone while writing my review it sounded so personal. It was rather depressing but I just kept remembering an article that I had read not to let reviewers destroy the creative child within you so shook it off and just told myself there will always be those who love my books and always be those hate my books and there will be plenty in between. The biggest thing was to enjoy what I was doing and no matter if no one read them or liked them, a piece of me would always be out there to share to the world through my creative eyes even after I am gone. 5. Tell us about your book and if it’s a series and how the public is reacting to this book. 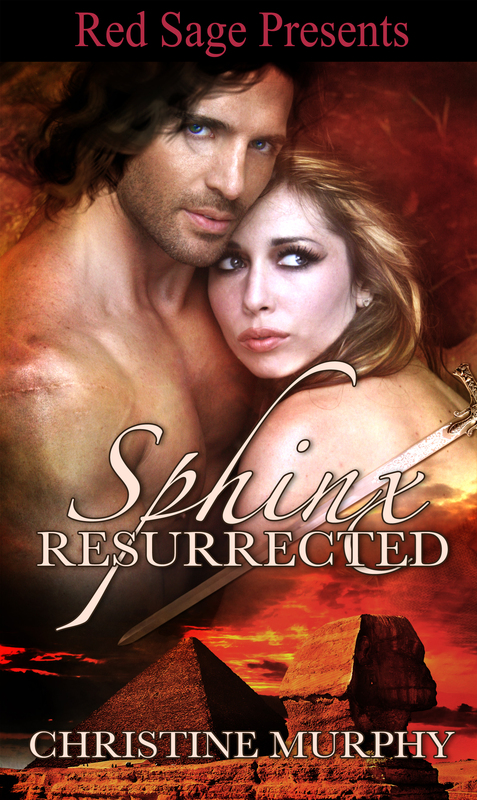 My first book is Sphinx Resurrected, the first book in The Sphinx Warriors Series. In Sphinx Resurrected, Stormy is abducted and Transformed by the magnificent blue eyed Sphinx leader, Michael. Secretly he Joins with her to save her and must deal with the desire and needs which manifest. Michael and Stormy’s undeniable attraction to each other will make them powerful as they join as one force to battle the evil Wraith. The next books in the Series will start being released in April 2014 and will be released one after another each month until all seven books are released including Sphinx United, Sphinx Transformed, Sphinx Imagined, Sphinx Awakened, Sphinx Tempted, and Sphinx Revealed. Sphinx Resurrected is my first book and has had a mix of reviews. It has been a positive learning experience and I have integrated the feedback into the next books in the Series to make them better, more action packed, more intriguing, and more passionate to capture readers imagination. 6. Can you share any and all links that are important to you as a person and the book? (You can relate more to a book if you know more about the author). Here are my many links and they will only continue to grow as I keep reaching out through the electronic world to those avid readers and authors out there. 7. I’ll wrap it up with this question since “7” is a lucky numberJ. Can you share an excerpt from your book, and I’d like to thank you so much for taking time to share your book with me. Please share as much as you’d like. Michael was spell-bound watching her. At first, he thought perhaps she wanted to just have the feel of the fresh grass under her feet while searching out the Life Force. But to his surprise, she was quite the quick study. As soon as she had made contact with the bare earth and searched the Life Power out, it had been drawn to her like it had been waiting for her forever. It embraced her much like the way he wanted to. To surround her in his energy and enjoy every square inch of her while she responded to him in a way the pure rapture on her face indicated she was responding now. He watched and almost felt he was guilty of spying on something intimate. She was a natural, harnessing the Life Power and quickly her body showed it. Her skin was sparkling and glowing from head to toe and he could see where her eyelashes were brushing her cheeks there was a slight glow coming from her eyes. He realized he had to intervene or she would quickly absorb too much. Being her first experience, his little Power Keeper could quickly get into trouble with what to do with it and possibly injure herself or someone near her. Had he known her intentions, he would have cautioned her on how far to go with this first experience. He stepped up as close as possible to her as he could. Reaching out, he moved to place his hands on specific spots used for contact during the Transference of Life Power. He had to place them correctly to make sure there was no back lash from the Life Power rampantly running through her. He grasped both of her arms with his hands positioned under her forearms and slid them as close as possible to her elbows. Luckily, with the movement, Stormy naturally grasped his forearms with her hands. He leaned forward and whispered in her ear, “Stormy, I hate to interrupt your enjoyment, but this is the first time for you as a Power Keeper, and any more we will both be in trouble.” On so many levels – he groaned in his mind. ***Christine is an accomplished author and good friend/colleague of mine. I strongly recommend her book. Began writing at roughly eight-years-of-age, but have been a full time writer for the past 16 years. Thus far, have completed 23 full length manuscripts, 146 short stories / novellas and numerous bush poems. I write an eclectic daily blog that encourages and hosts writers, authors, Human Rights lawyers, musicians, poets and others from around the world. The blog currently goes to 34 countries. I also mentor 43 young writers around Australia, write a monthly editorial for a newspaper and lecture to members of the U3A – University of The Third Age. Not only, I am a Human Rights activist and social justice campaigner. Writing is a tough gig, but I’ve been fortunate to win some major awards. Not that they have done me any favours. My first book is modern / historical fiction for young adults. I wrote it hoping it might become a prescribed text for junior high school kids and, hoping kids would enjoy an enthralling story about drought, tough times and life in 1910 Australia – rather than reading a text book. Interestingly, the book has become loved by people from 8 to 80 years of age. Why historical fiction? I grew up on farms and have always had a great admiration for our pioneers. Marketing is a necessary evil for an author. Sadly, it takes an author away from writing. Normally I promote my work by promoting and marketing my brand – Clancy Tucker. Book reviews in major newspapers and interviews like this have always been beneficial. I have a large contingent of followers on LinkedIn, Twitter, Facebook and Google+. However, the search for the ‘silver bullet’ to success has alluded me. 4 Do you remember your first review and how it made you feel? (If it was a bad one, also tell about your good one too). Yes, it was by an editor; not that I knew at the time. Her helpful comments made a lot of sense. I guess I’ve always been open to suggestions and advice, so I didn’t take any offence. Learning to take good advice onboard is paramount if you want to be the best writer you can be. I’ve had many top reviews. 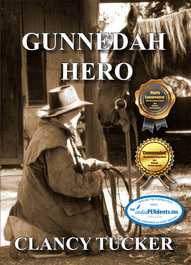 Yes, my first book, ‘Gunnedah Hero’, is part of a series. The sequel is already finished (A Drover’s Blanket) and I have at least another 15 stories to write in the series. 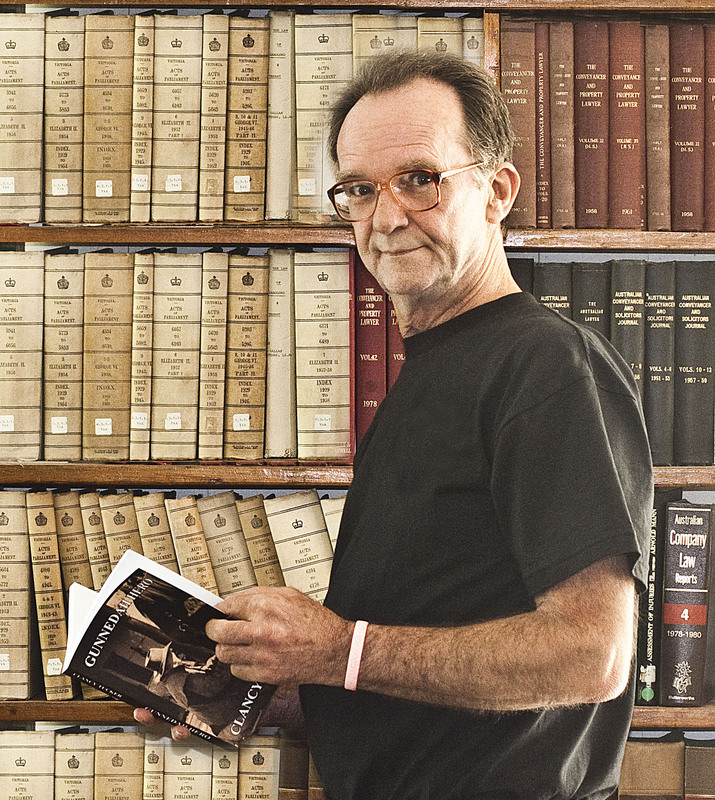 Gunnedah Hero has won two awards in the Australian National Literary Awards and has been received well by all ages. It would make a magnificent movie for the entire family. Intro: Gunnedah Hero is about a 14 year-old boy, Smokey Danson who, during a severe drought in 1910, takes the remaining family cattle up what is known in Australia as ‘The Long Paddock’ – the public roads, searching for food and water to keep them alive. Smokey has a pack horse and three loyal cattle dogs. On the trip he experiences all sorts of disasters, suffers from loneliness, meets great people, finds a cache of gold, is a key witness in a double murder case and is hailed the Gunnedah Hero. “The snake became more and more aggressive and unpredictable. Sam was growling deeper now and had crouched on the ground in the attack position. Roscoe and Jedda were also awake, aware of the slippery predator and barking loudly. Their noise didn’t help the situation. In a split second, Sam attacked the snake and I felt its cold tail crease my forehead as it writhed in battle. I took a chance, got to my feet and jumped to a safe place on the other side of the campfire. While my brave kelpie fought the snake, I searched for a large piece of timber that would do the reptile some damage. Normally I’d have used the stockwhip to kill it, but Sam was too close. I was petrified I’d strike her by mistake. I grabbed a sizeable piece of lumber and turned back to the verandah. As I swivelled around I heard a piercing squeal and saw Sam limp away. She flopped under the lemon tree and frantically rubbed her snout with both paws. The snake had been badly mauled by her sharp teeth but it was still writhing close to my saddle, smearing blood on the floorboards of the verandah. I was furious and smashed the snake with the timber at least half a dozen times. It was still moving so I thumped it another three times until it was dead. Roscoe and Jedda sniffed at its messy remains while I dashed towards Sam. It was too late. She was dead. ***Clancy is a wonderful, humble man whom I look up to quite a bit. I strongly recommend that you check out his book and his links. 1. Please introduce yourself. Tell us a little about the person behind the pen. My mom was a great writer, and I played at writing before I knew what was at stake. I’ve written ever since I can remember, but began to publish children’s stories in my thirties. Then there came a long period of “abstinence”, until a stupid discussion about suicide prompted me to write my first novel, “Just Toss the Ashes”, in 2005. I am now working on my fourth novel, after having published two others, four self-help books, a guide to Joyce’s Ulysses, and a biography of Korean filmmaker Kim-ki Duk. My fiction deals with real life; thus, it is triggered by true events, although I do not write about any particular person or real situation. I tend to focus on the unpalatable side of life, drawing attention to what people would rather not hear about. Going against the grain will not earn me a place among best-selling authors for sure, but I have no regrets. The truth is I do not do much to promote my books. Once they are out of my hands, I leave that to the publisher, who does what he can. I have tried some resources, but don’t find them helpful. In the long run, my books sell either because people find me “interesting” -*grin*- and are intrigued about my work or because readers recommend them to friends. 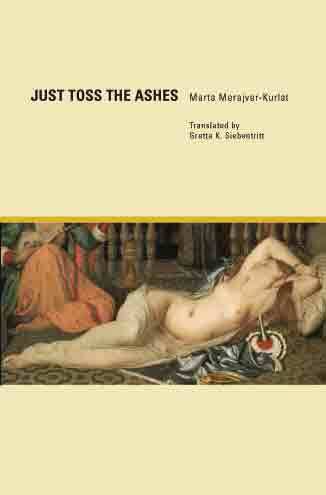 “Just Toss the Ashes” has been selling steadily since it was first published, and that is a remarkably long time for a novel to keep in the loop. My first review was not bad, but the critic who wrote it for an American online magazine specializing in Latin American literature read the Spanish version, and I’m afraid her Spanish wasn’t good enough to cope with the nuances of the language. How it made me feel? I just wanted to kill her. There were many others for the English version, all of them showing full understanding and appreciation of the novel. I don’t write series. This particular book explores suicide and its sequels, through the journey the dead woman’s son undertakes to find out about a mother he didn’t really know. The public has embraced it as a means to understand something that may be unthinkable or taboo, depending on each person’s take on the meaning of life. Also, many people that experienced a loss through suicide approached me to tell me that the novel had proved healing. “Heading downtown from his luxurious home in Martínez, he went over the Sylvia case in his mind, since he would not have time to stop by the office to pick up his notes. He would do it later and possibly use them to present a paper at the next conference. He wondered fleetingly why he hadn’t seen it coming, but discarded the notion almost violently. He wasn’t a magician and she had deceived him. One way or another, patients always lie whether they know it or not, and they always hide things, even when they don’t intend to. Dr. Garnet intuited that this act was not the result of a sudden impulse, but rather had been carefully planned and that, in a way, she had used him, sometimes as a pawn and sometimes as a king, in a game of chess. As a pawn he was disposable and to top it off, she had checkmated him. She had shut down all movement with no warning, sending up smoke screens that had kept him from seeing what she was up to. And now, she had wiped him off the board. Looking for a parking spot, he was frankly angry. The suicide of a patient that he had diagnosed as non-suicidal could damage his professional reputation. Not to mention that the family could lay the blame on him publicly as well as privately. Thanks again, Lori, for having me on your page. I feel honored, for I very much admire you and your work! 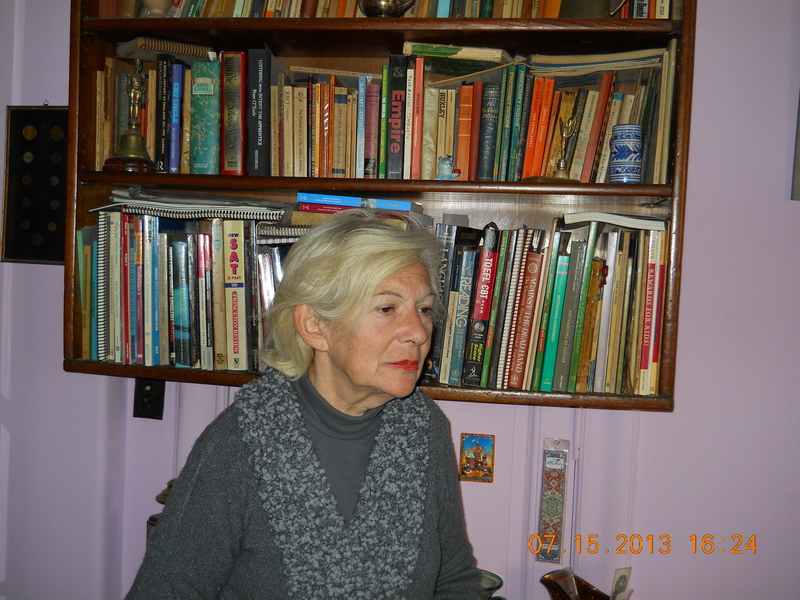 *** Marta is a WONDERFUL author and par excellent’ colleague. She is caring and warm hearted and I strongly encourage you to read her work! Thank you so much Marta for allowing me to interview you. A mathematician by nature is a strange beginning for a writer of poetry. Born into a family rooted in the field of education destined my life’s profession to becoming a teacher. The atmosphere of a small town kept families close and the importance of school was instilled at an early age. As an educator, I always found myself writing but that role primarily centered on lesson plans, along with curriculum. I definitely never envisioned myself as a published writer/author. My expertise was in mathematics and science. Did I think about writing a textbook? Nah! Almost thirty years in the education field finds me today enjoying retirement but not yet ready to cut the educational umbilical cord. Instead of a real-life classroom where I greet my students face-to-face, we meet in the virtual world of the online classroom where the students are now teachers. The most rewarding part is when my long ago eighth grade to senior high classroom students appear as students of mine once again, this time as an educators themselves. Priceless! Poetry became a way of expressing my innermost thoughts to touch the heart and soul of those I love, as well as strangers. Poetic verses found themselves being generated from random thoughts, impromptu conversations, casual images or pure imagination reflecting feelings to warm the heart and lift the spirit. 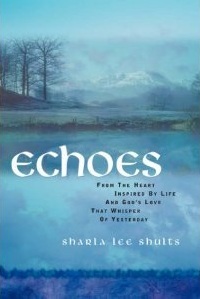 My first two books, Echoes and Remembering reflect inspirational poetry. Both fact and fiction found their place with family being my inspiration: my husband for divine love and spiritual uplifts; our children for many memories, happiness as well as tears; my mother who taught me life is a bed of thorny roses; my dad for believing in me, keeping me toward life’s goal. 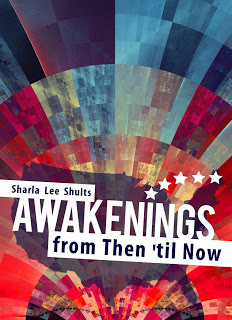 A shift in poetic thinking guided my third book, Awakenings, toward historical poetry. This was somewhat out of character since history had always been a back burner subject of mine so to speak. Through the years, however, a strong affinity toward America and her history developed. Therefore, the focus of Awakenings became Embrace the Past, Empower the Present, Enrich the Future. Promotion has been difficult. Time and consistency are most important factors in promotion. Neither of these worked well for me over the past year. Life got in the way. As I strive to move forward, it is the social media networks that have become my sources of communication and promotion, Twitter, Facebook, Google+, LinkedIn, Writers’ Group, Pinterest, Scoop.It, Tumblr, StumbleUpon, personal blogs, personal website. Then, of course, the best is perhaps the book signings. Unlike social media, with the book signings you get to meet the author face-to-face. You sell yourself first, then, your book. Oh, yes! I remember that moment well. It was the first review of my first book, Echoes. I cried. Heartbreakingly cried! It was so vindictive and definitely was written as a means to belittle me, as the author, as well as my writing. I have contacted Amazon repeatedly hoping to get it removed because it is not a review for the content of the book. No response. On the flip side, the remaining reviews have been excellent 4 to 5-star. From heartbreaking to heartwarming. These have brought on their own share of tears but this time happily and thankfully! I truly treasure those than imply they ‘see’ what I ‘see’ when I write. Creativity arises from imagery. The words of imagery are the photographs of poetry. I will focus here on Awakenings, which presents some of America’s momentous historical events in poetic verse. The rhythmic character of the verses in this book is designed to add flair to what is sometimes regarded as dull reading. History by its very nature is extremely poignant. The scene begins with the seventeenth century, a time absorbed in thoughts of death, physical love, and religious devotion. The woman’s role adheres to silence in the public arena and provides unstinting obedience to father and husband. Emotions unwind and remain somewhat unsettles as the journey through time spans five centuries. The audience for Awakenings is somewhat limited since its very nature is poetry. The average reader is more inclined toward selecting a novel rather than a book of poetic verse. Public reaction has been slow but good. Once the purpose behind Awakenings is understood I am hopeful the audience will expand. From mystery to romance to poetry and more – visit The Write Room Blog for sure! Into the scary bit? At The Write Room you’ll find a hit! Awakenings is dedicated to those who laid the foundation and established the platform for our American freedom: those who have served in the past, presently serve, or will serve our military forces in the future. A profound appreciation is extended for the sacrifice of these brave men and women who left or will leave their homes and family to ensure America’s freedom endures. A grave price is being paid every moment of every day of the year for all the freedom America has to offer. Let us not forget those who have fought or are fighting for our nation; they are the epitome of the human spirit called freedom! What does the past whisper to you? Whisperings from the past reveal themselves in many forms: happy whisperings from the heart, melancholy whisperings from the mind, quiet whisperings from the soul. Each of these is grounded in beliefs instilled in us by our ancestors from events that transpired years upon years upon years ago. 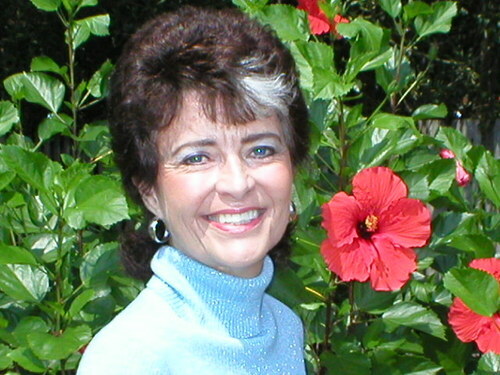 *** Sharla is quite a prolific writer, a kind human being and such an intelligent and caring individual. I highly recommend her books. I personally have “AWAKENINGS”, and LOVED IT!! Readers Rock is the new magazine for READERS and Authors alike. This is Tammie Gibbs first digital magazine. 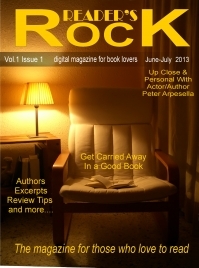 This month there is an interview with Actor/Author Peter Arpesella. Their are book excerpts and tips on what reviewers look for.